With NHL 17 being the second version of EA's hockey sim to be released since the shameful PlayStation 4 debut that was NHL 15, fans of puck-based sports were rightfully expecting the good work done in last year's edition to carry on through and be improved upon even further to really bring the franchise into the current generation. There were warning signs suggesting that wouldn't be the case, but though the changes listed in the various pre-launch press releases all sound like standard EA Sports annual update fare, those fans will find that they've been rewarded for their patience. The features added this time around will be genuine game-changers for a lot of players. A new FIFA-inspired Draft Champions mode in Hockey Ultimate Team allows you to pick a squad through twelve random draft rounds – which will invariably include some legendary players such as Brett Hull or Curtis Joseph – and then take them into battle against increasingly tough AI opponents or into competition against other players online. HUT rewards are then handed out depending on how you do over the course of four matches. Draft Champions is something that could be deeper for sure, but provides a nice distraction and is free to play, unlike in the game's footballing cousin. Similarly to this year's FIFA, there's a new use for your unused Ultimate Team cards, where you can build a full set of themed cards from your cast-offs and trade them in for bonuses and new packs. It's a game of risk and reward, though, as the temptation to drop an active lineup player with good team synergy into a set to give away in the hope of getting something better is definitely present. A revamped Franchise mode is in play too, replacing the increasingly stagnant Be a GM mode from last year and going so far as allowing you to amend the prices of food at your concession stands, upgrade your stadium, or even shift your team to an entirely new city. Maybe the Maple Leafs would do better in Miami? Maybe you could get on board early and provide Las Vegas with its expansion team before they officially debut next season? The choice is yours in what is likely to prove to be a real time sink for dedicated team owners. The way in which ticket sales and prices are affected by your on-ice success adds an extra rung to reach for, too. You aren't just playing to try to win Lord Stanley's Cup right now, but managing your financial base to ensure that you can build your team for the future to ensure multiple championship successes. On the ice, there are worthy alterations to be found. The main one – and arguably the most impressive one – is the addition of genuinely helpful player feedback. The trainer functionality now goes as far as teaching tactical awareness, as well as just reminding you of the controls now and again. If you're not familiar with the ins-and-outs of crashing the net or playing the wheel on the breakout, NHL 17 will at least attempt to give you an idea of what to do by providing handy overlays that suggest passes or tell you where you should be positioned on defence, for example. In the improved Be a Pro mode, the new functionality is used as the main backbone of your player's development. Your coach will reward you for doing things indicated by the trainer system that really help the team and in another improvement, is no longer simply looking for you to be a goalscorer. In previous games, you could play selfishly yet still do well by bagging a goal or two. That isn't the case anymore. You can tuck away a hat-trick and win all the plaudits, but if your team only won a squeaker 3-2 and you were hogging the puck, taking overly long shifts or not helping out on defence, you could still find yourself shifted down to the second line for a few weeks until you learn to be a team player. Physical battles in front of the net are brought into focus this time around. A larger player can set up for a deflection or to block the goalie's line of sight by having a controllable shoving match with a defenceman. 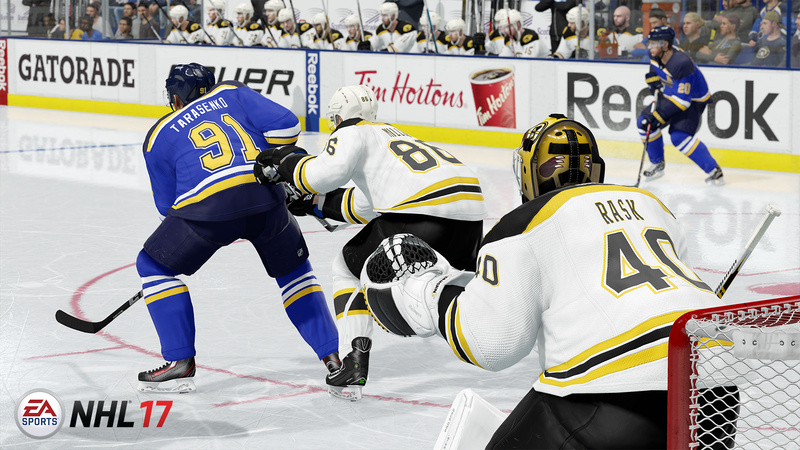 During gameplay, unless you're playing Be a Pro or as part of an EASHL team online, the new net battles only really make a difference to how things play out if you're on defence, as when you're on offence, you'll likely be controlling the puck-carrier. But there are times when your AI-controlled teammates will get into it and make some nice space for you. The AI has been switched up elsewhere also, with new goaltender animations and logic meaning that where you may have been slotting them home from all over in NHL 16, you'll need to put a bit more thought into your attacking play this time around; you need to look for weaknesses in the guy between the pipes and exploit them when you get a chance in order to light the lamp, making scoring a goal something of a cerebral challenge at times, rather than just whether or not you can aim your shot into the top corner and avoid any defensive blockers. These changes all add depth to a game that, while much improved over the generational leap of two years ago, was in desperate need of it. 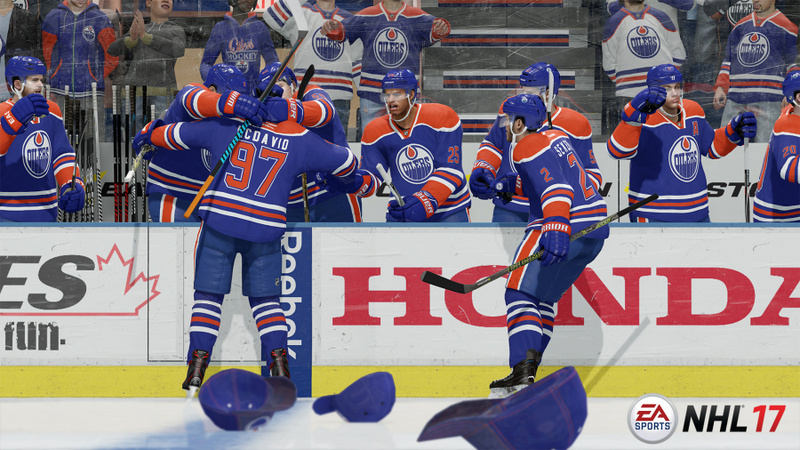 The Maddens and the FIFAs of the world have added features and tweaked gameplay every year and the new inclusions and adjustments haven't always been matched in the NHL franchise. 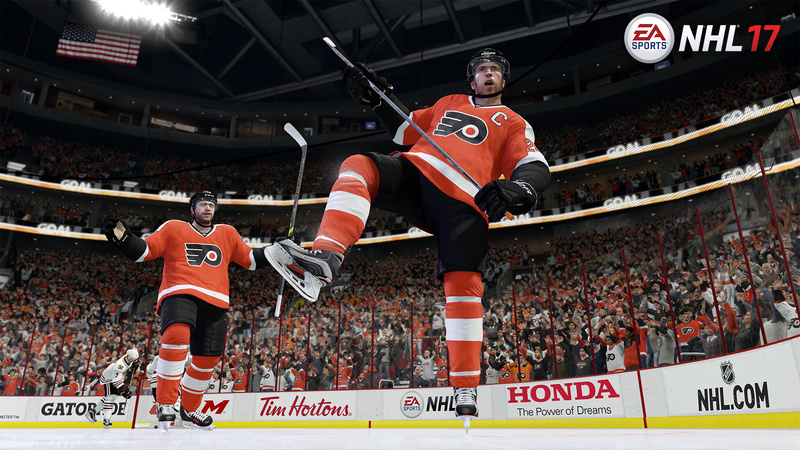 NHL 17 changes all of that and brings the series right up on par with its brethren. That isn't to say that there aren't still improvements that can be made. The menu system is a very cool and stylish looking step forward, but that polish is lost a little when you're stuck watching the game seemingly do its sums on an abacus to work out what it should do next, grinding along as it does so. Simulating a week in Franchise or Be a Pro follows a similar route and ends up taking an age. Another more pressing downside comes when playing on defence. Changing players to the last man when defending against an odd-man rush is imperative, but hitting that switch button doesn't always garner the result that you're looking for. In fact, you'll sometimes end up switching to the player closest to the puck, whom your opponent is already clear of. It doesn't happen every time, but when you've correctly predicted the centre's move and just need to put your counter-manoeuvre into action to block it, only to see him slip by and jam the puck through the five-hole because the game's decided you should be controlling a guy at centre ice, it's more than frustrating. These relatively rare occurrences aren't enough to stop NHL 17 from being a real treat for hockey fans, though. Think I'll stick with NHL 16. Nice review. I haven't played since NHL 10 and the PS4 versions haven't impressed me much but this one sounds better. I loved Be a Pro mode. 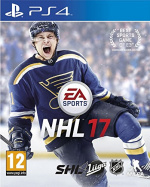 NHL 16 is great but I'll definitely buy 17 when it drops below $35. I broke my rule of "Never buy any sports game brand new." When I bought F1 2016 but I really wanted it and there was literally only one copy in the town I live in. @OldSchoolHeel One of the last non-legacy games on 360 was my favourite. Can't remember which year now. 16 is OK but still trying to find right adjustments to the sliders. @VenomSnake08 I picked up F1 2016 last week. So far so good. Huge improvement over last year. Just started a career, in fact. @BoyFromMars82 I started a career a few days after I bought it. Went with Manor since that's way more challenging then joining Scuderia Ferrari or Mercedes Patronas right away for example. Hopefully a few years in the career I can join Scuderia Ferrari which are my favorite team in real life.